UPSEE stands for the Uttar Pradesh State Entrance Examination which is the gateway exam of the Abdul Kalam Technical University(AKTU). This exam is yearly conducted by the University to grant the admission to all the aspirants into the various graduate and the post graduate programs of the University. As per the latest notification of the University it has issued the UPSEE exam schedule for the year 2019. The exam will be conducted on the April 21st 2019 at the relevant exam centres for the candidates as per their admit card. If you haven’t registered yet for this exam then you may make your application for this exam any time between the date of 23 January to 25 March 2019 at the website of the AKTU University. Only the candidates who make their application for the exam will be allowed to take the examination. Further all the candidates are informed that the UPSEE 2019 exam will be based on the offline paper pencil mode. It means the candidates would be allowed the physical paper and pencil in the exam to write their exam unlike the online mode.All the 8 papers of the UPSEE 2019 will be based on the offline paper pencil mode. The UPSEE exam is conducted by the AKTU University to offer admission to all the aspirants into the courses such as the B.Tech/B.Arch/B.Des/B.Pharma/MCA/MBA etc. The candidates who qualify the exam with the minimum rank to make themselves aware for the counselling session are then qualified to the counselling session. The counselling session is the last phase of the University admission in which the candidates are allowed the admissions in the respective colleges, as per the rank scored by them. 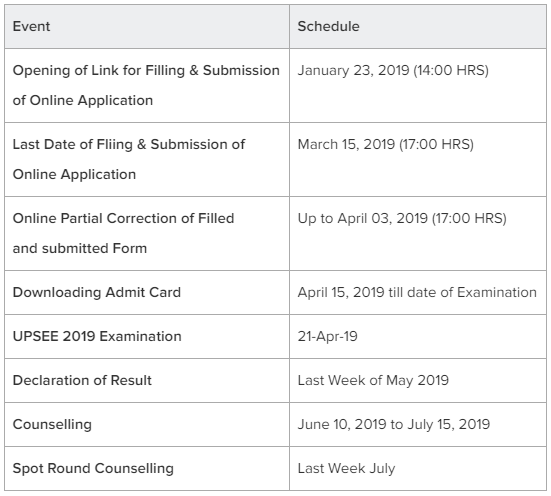 You can get the admit card for the UPSEE 2019 exam from the 15 April onwards, and can expect the result by the end of May 2019.